FinalBuilder's interface is dockable and completely customizable. To the right is a screenshot of the default layout. You can refer back to this screenshot (click to enlarge) to see which dock zone each of the interface elements belongs to by default. 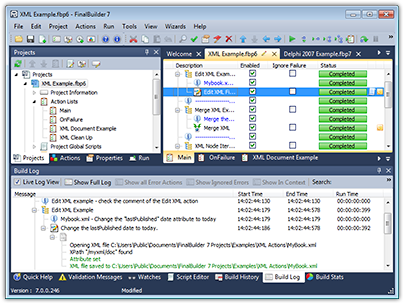 FinalBuilder provides more than 600 pre-written scripts, called actions. Actions can interop with compilers, version control systems & testing tools, perform file operations and much more. To automate each stage of a build process, actions can be combined into an action list. The "Actions" tab lists every action that can be added to your build project. To quickly find the aciton you require, there is a "Search" box at the top of the Actions tab. You can search for actions by action name eg. 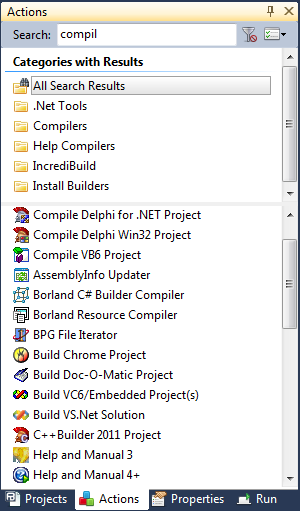 Build VS.Net Solution, product name eg. 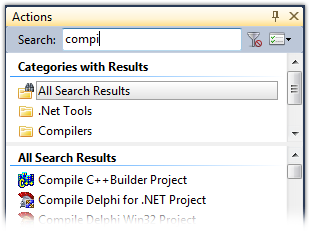 Visual Studio or category eg. Compiler. To add an action to your build project, click on it or drag-and-drop it into and Action List. The main action list is where you define your build script. The build process will consist of a set of actions, which are executed from the top to the bottom during a build process. Actions may be laid out in a parent/child hierarchy to add structure to your build process. In the example to the right, some nodes of the build process from above have been collapsed ("Try" and "Catch") to focus attention on the steps in the "Finally" action group. 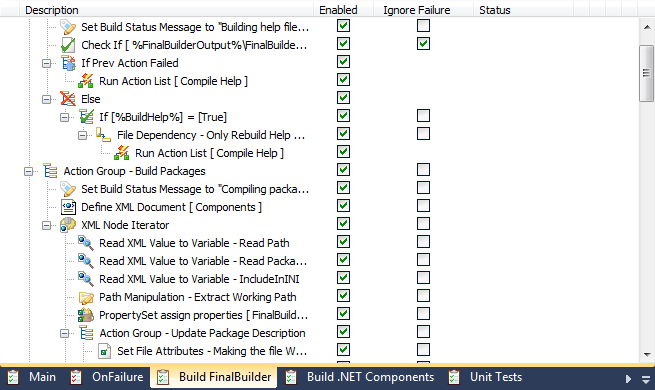 The OnFailure action list is a special list of actions which get executed only if your build fails. 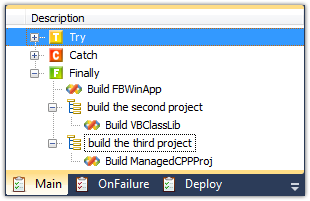 OnFailure actions typically "clean up" so that the next build runs without error (eg. Check files back into version control). 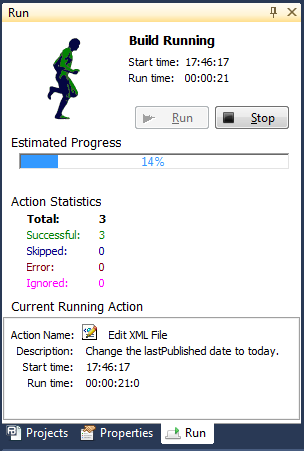 To run a build, click the run button on the toolbar, or select the Run menu option from the Run menu. 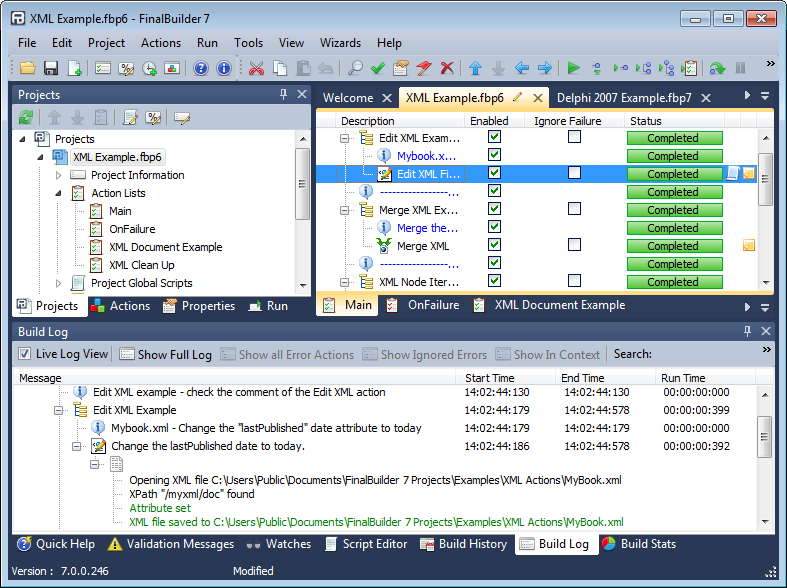 Running a build puts the FinalBuilder IDE into a build running state where it automatically selects the current action being executed as well as displaying logging information in the build log (see below). When a build is running you cannot edit any actions, but you can change tabs at the bottom of the IDE so you can access the Run Status, or Watches for example. 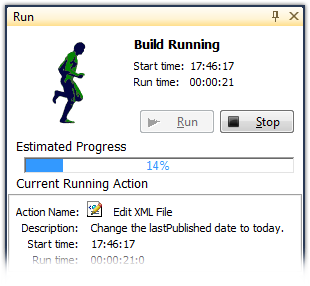 You can pause or stop a build using the Run menu or the toolbar buttons. The build log is where the output and logging messages of a build are stored. 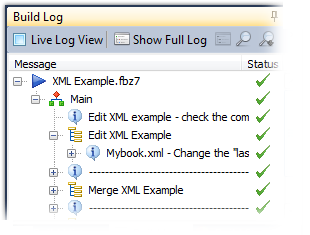 The log is organised in the same hierarchy as your build process and records all the timing, status, and messages which occurred during the build. The build log is updated in real time, so that you can watch the progress of the build.